WINTER’S return, call of the mountains, excitement of a child at Christmas. Rising from warm bed at 5am, morning silence, sliver of light lining dark horizon, frost glistening on grass. Porridge, hot drink, extra layers for chill ahead, final gear check, empty roads on way to meeting point and kindred spirits. 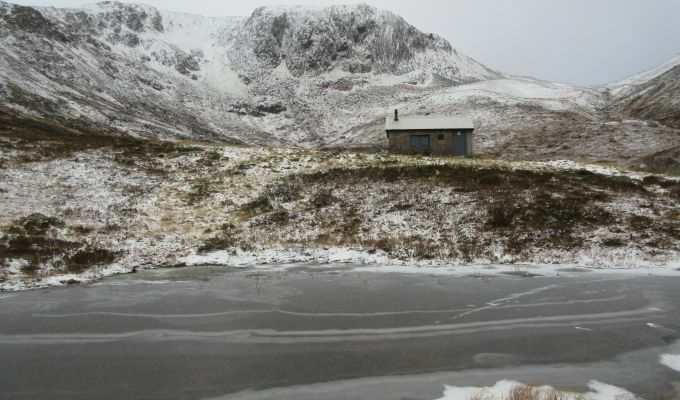 Flashback, day before: Winter rucksack prepped, crampons, ice axe, emergency shelter packed, torches tested. Old faithfuls emerge – Extreme fleece trousers, inherited snow jacket from Icelandic trip, battle-scarred Scarpas. Broken toe section, dash of superglue and some duct tape, fine repair job - I hope. Now: Dawn rising slowly on Glenshee road, deer startled, birds of prey swing lazily off carrion. Animated faces checking out snow cover on surrounding slopes. Full light at Braemar, bright, breezy, high tops waiting, lounging around in seasonal white ensemble. Clangs and clatters of mountain ironmongery, voices echoing. Through the trees at Linn of Dee, initial walk to Derry Lodge with tantalising glimpses from first bridge of mountains ahead, so near, yet so far. One hour in, groups split, some for Glen Derry route to Derry Cairngorm, some opt for Carn Crom approach, others for Carn a’ Mhaim. 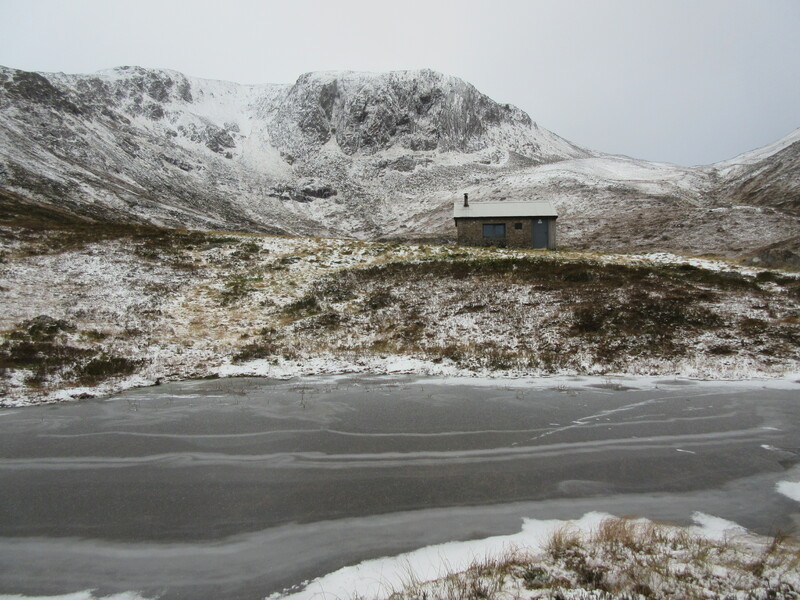 Walkers emerge from Bob Scott’s bothy, huge packs, end of four-day Cairngorms circuit, weary but satisfied, one last snow trek. 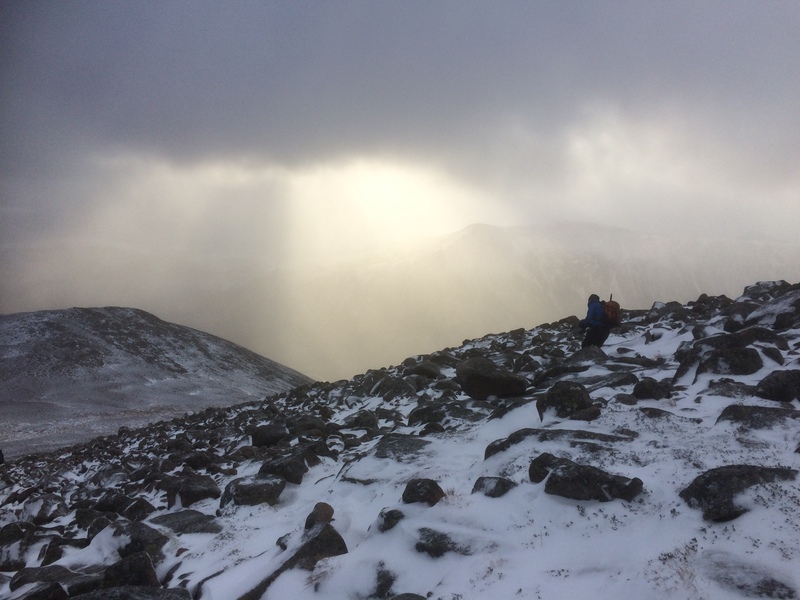 Biting wind sweeps across the glen, snow showers whipped into our faces, shadow of Derry Cairngorm ridge looming large on left. Path, alternately clear then icy, visibility in and out. Skeletal Scots pine points way ahead, dead sentinel, fallen partner lies below, twisted, stripped bare. Dark gap of Coire Etchachan hoves into view, vanishes again, glimpses of streaked rock giants book-ending our entry point. Lunch stop at Hutchison Hut, a speck against massive dark cirque. Welcome break from constant wind and cold, just one other soul, hot drinks, extra layers, back out to moaning, buffeting wind. Heads down, rising beside tumbling grey waters, struggling to stay upright. Dogged push to Loch Etchachan, highest in country, heart of Cairngorms, shadowy stain below massive walls of white. Greeted by icy blasts, stinging waves of light snow, blurred images, waters like mirage in these pale whirlwinds. Left turn, open ground, more shelter. Peaks to east suddenly lit up, golden wash stretches over landscape’s white undercoat. Derry Cairngorm dead ahead, shapeless in gloom. Final climb, gentle angle, hopping boulder to boulder, fast progress, ridge gaining definition as air clears. Twin cairns, back into teeth of wind. No hanging around, fast drop for respite. Trickier underfoot, iced boulder field, deep snow in hollows, careful descent, trousers crusted with frozen snow. Blasts of sunlight pierce towering clouds, light almost unearthly in these bruised skies. Spotlight on Carn a’ Mhaim. Ben Macdui appears in full view for first time. Over Little Cairngorm, on to rocky Carn Crom, weather improving by the minute. Drop out of snowline, protection in trees, core temperature soars as wind kept at bay. Derry Lodge again, short rest stop. Bite to eat, strip down layers, dry feet, superglue success. Trudge out with wind at our backs, fading light. Full dark on exit, stop for much-needed hot meal, occasional pinpricks of light only sign of life on return journey. Home safe, fully sated. First of winter, more please.